Grier School | Happy Halloween! Grier celebrated Halloween on Friday with costume contests, a bonfire, trick-or-treating, and a school dance. During the school day, students and teachers dressed up in costumes that ranged from the beautiful, the silly, and the frightening. Some classes used the Lab Days prior to Grier's Halloween celebration to carve jack-o-lanterns that decorated the Colonnade. 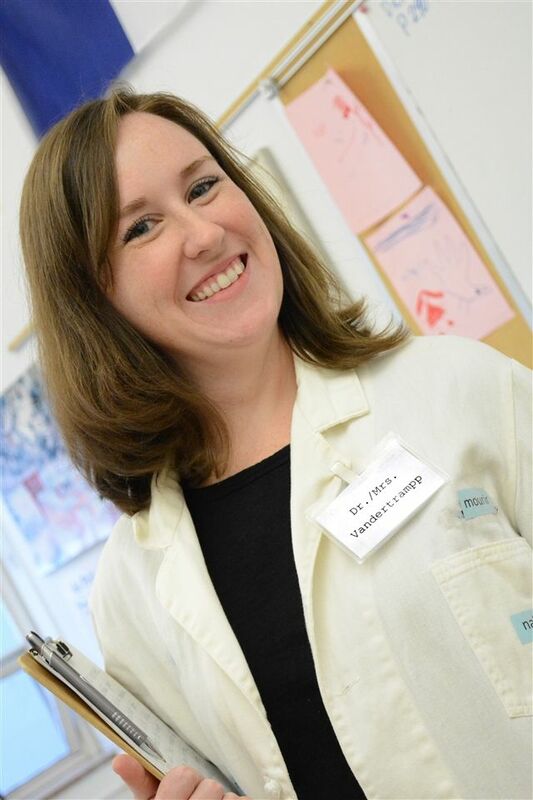 Many students and teachers had fun assembling group costumes. 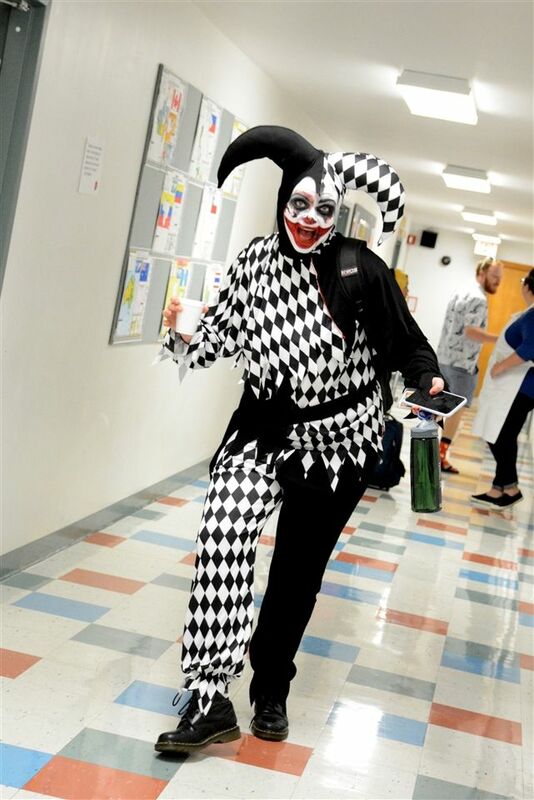 Halloween classics like the grim reaper, vampires, and witches wandered the school halls along with characters from current pop culture, including anime, memes, and more! 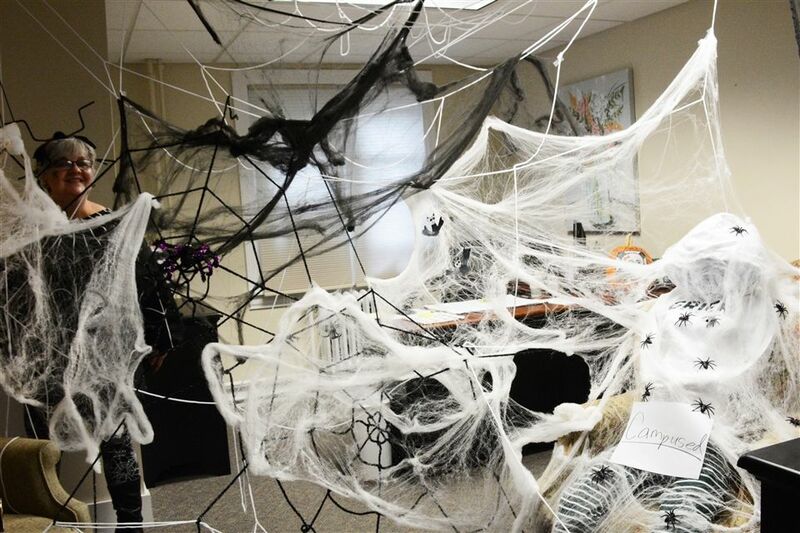 Mrs. Borst’s office was a macabre scene, draped with silky spider webs and what appeared to be a Grier student caught in Mrs. Borst’s web. Mrs. Borst, herself, was, of course, dressed as a spooky spider. 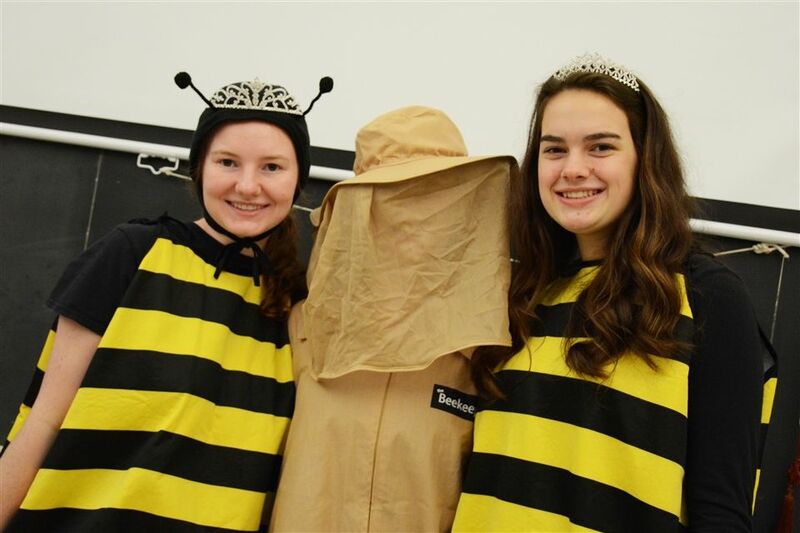 During the assembly, students competed in costume contests for the scariest, funniest, most creative, and best group costumes. Next up, costumed teachers then participated in a contest for the best teacher costume, as judged by student applause. Taylor won for scariest costume, with her creepy jester costume. In her traditional Chinese costume Jammy tied with Alexa and Grecia who were “Bad and Boujee” for most creative. Olga took the prize in the funniest category for her Putin. Girls dressed as the cast of Gray’s Anatomy won the group prize. Mr. Ort and Mrs. Reinhardt’s son took the Faculty prize in his tornado costume designed by Mrs. Kelley, but honorable mention was given to Mrs. Hensor and Mrs. Carper for their amazing Barbie Styling Head costumes. After dinner, students headed over to the bonfire hosted by the Anti-Bullying Club (ABC) in Mrs. Gina Borst's backyard. Students played games, including one hilarious race to eat a donut off of a clothing line without using their hands. 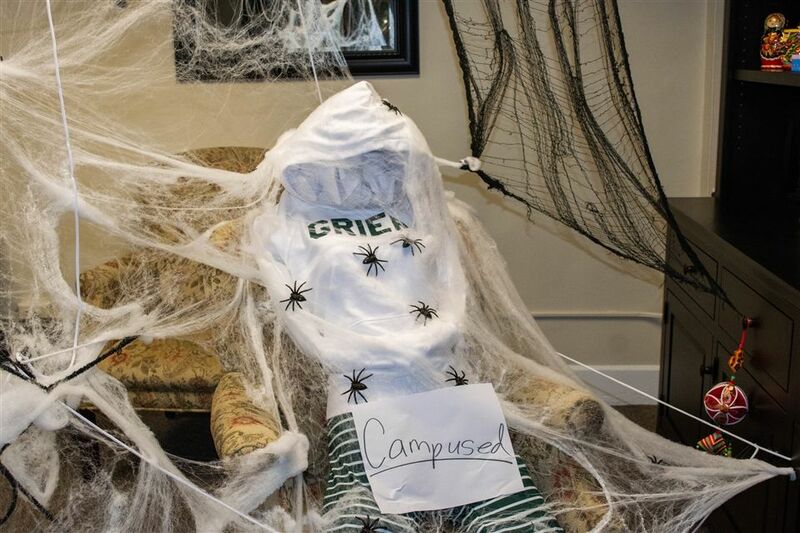 Following the bonfire, students went trick-or-treating to on-campus faculty houses, saying "trick-or-treat!" in unison at each door to receive a handful of candy. Finally, fueled on fun and sugar, the girls met up for a costumed Halloween dance. 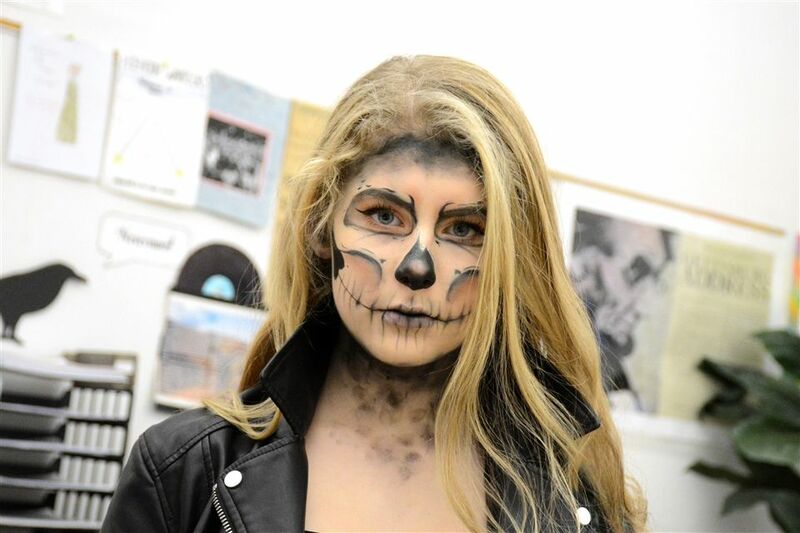 Hannah in stunning skeleton makeup. Mrs. Borst the spider lurking in her web! An unfortunate student caught in her web. Taylor has mastered the element of creepy. French teacher Madame Pope is the personification of Dr./Mrs. Vandertrampp, a pneumonic device French language learners will recognize! Rachel and Bella are pros at this scary thing. 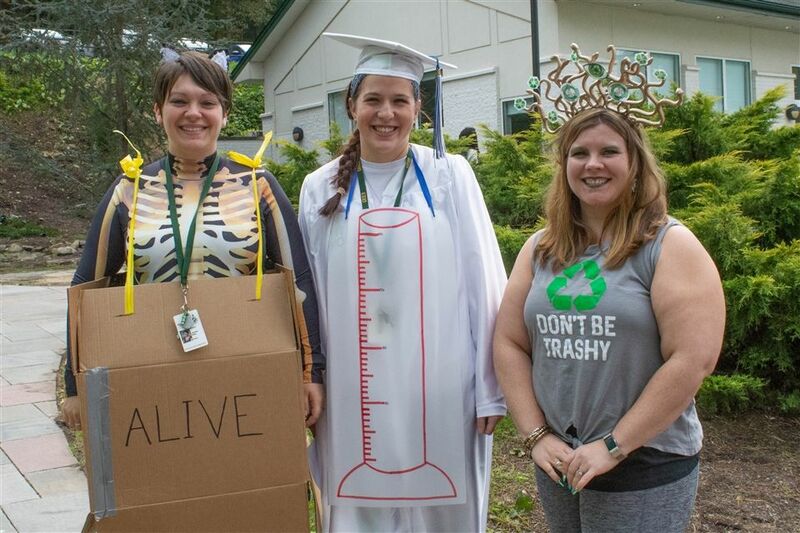 Some punny science teachers as: Schrodinger's Cat, a Graduated Cylinder, and Redusa. A beekeeper with some bees. Former Bostonian Mrs. Forest rooting for the Red Sox. Mrs. Carper and Mrs. Hensor in their elaborate Barbie Styling Head costumes. 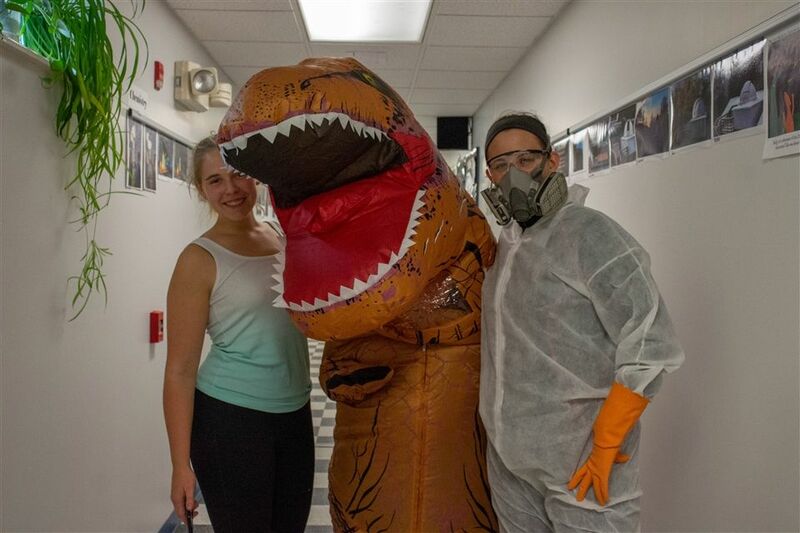 Mrs. Fernandes is T-Rex and Ms. Moyer is doing some kind of hazardous work. Mrs. Piotti is Tippee Hedron from Alfred Hitchcock's "The Birds." In the running for Funniest costume. Grace's Olivia Newton John is spot-on! Solveig is a graceful gray feline. 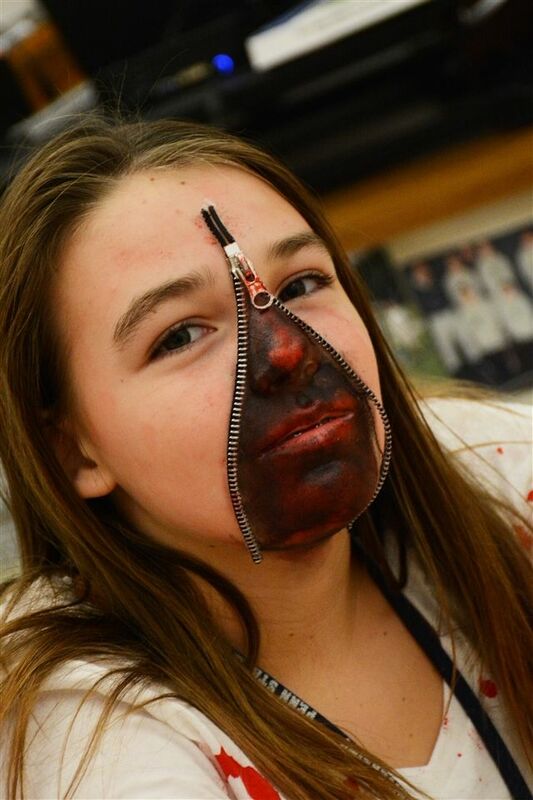 More students vying for "most creative" costume. Liza is an anime character. Alexa and Grecia are "Bad and Boujee." Alex is Taylor Swift in a bathtub of diamonds. A take on Alice in Wonderland. Jammy in traditional Chinese garments. Sarah and Ashley evoke a by-gone era. 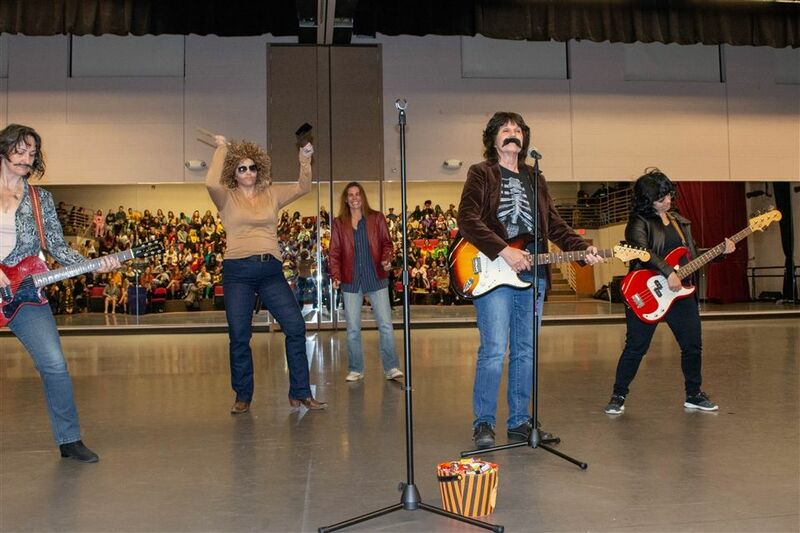 Teachers recreate the SNL sketch "More Cowbell!" Mr. Lang is Dwight Schrute. A group of teachers become SHARK WEEK! This is the cast of "Gray's Anatomy." A Hot Mess, the Iron Chef, and T-Rex. 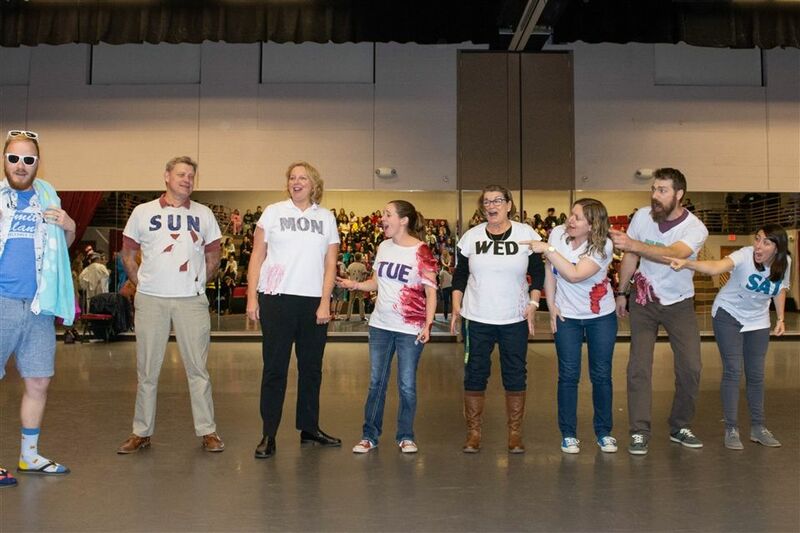 Teachers displaying their best costumes.